I’ve finally reached the point in the move that never ends where what I have left to do is minimal enough that I can actually relax a little bit in the evenings. I can sit down on my new-to-me couch with a wine glass of soda (because I’m just that classy) and after two months of reading nothing but fanfiction because I didn’t have enough brain cells not dedicated to moving to make sense of anything else. My bookshelves are up, and while my trade books are still in stacks on the floor, my YA and younger books are up on their shelves in the living room. Most of my life is still in boxes, but that room feels like home. There are books there that I have been wanting to read for MONTHS, but they’ve either been in storage or my brain has been thoroughly absent. The other night I went to the wall of books to choose one to read, and I hit that moment that every bibliophile hates: THERE ARE SO MANY BOOKS I WANT TO READ AND I CAN’T PICK. 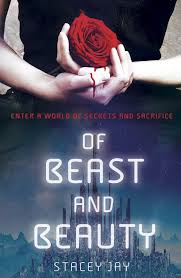 But the cover of Of Beast and Beauty by Stacey Jay kept jumping out at me. Something about the rose against that pale skin, with the city beneath it. And it’s a jump-off from Beauty and the Beast, which is a story I absolutely love. The world-building is gorgeous, distinct and strong, and while it’s been thousands of years since the settlers arrived on this new world, we still get pieces of the pure shock as a scientific culture suddenly finds itself face to face with magic. Forced into change on a physical and genetic level by the planet’s native magic, the population split- the Smooth-Skins, those left relatively unaffected by the mutations, who live in domed cities away from the ravages of a harsh environment, and those they call Monsters, those who lives out in the wilds by grace of the mutations the Smooth-Skins fear. The cities have a covenant with part of the planet’s magic force, a pledge of sacrifice to keep the cities thriving, but it isn’t enough to keep the children from being born missing some piece- sometimes a voice, or sight, or hearing, sometimes extremities or limbs, but every child born within the cities has something missing. Mutations can also be found within the city, and those Banished, as they’re called, are cast to the very outer edges of society. Those the Smooth-Skins call the Monsters eke out a meager existence, scraping by on harvests that diminish with each passing season. The narration passes back and forth between two characters, for the most part, with occasional interjections from a third. Isra, the princess of the domed city of Yuan, has been blind since she was five years old, after a terrible fire that led to her mother’s death. She has been sequestered in a tower since that point, interacting only with her father, her father’s chief advisor, and her mute maid, Needle. She escapes the tower from time to time, going out to the royal gardens where the roses have their own magic to help her ‘see’. Gem is from a tribe across the desert, a reluctant warrior sent on a dangerous mission as the last hope for his people- and his infant son. Bo, a soldier and the son of Yuan’s chief advisor, fills in some of the elements we would otherwise miss. The language is distinct between the three, Isra sharp and longing and defiant, Gem with a storytelling soul and the deep desire for home and family, Bo formal and uncomfortable. One of my favorite things about this book is Isra’s personal journey. She is so sheltered and naive, but her arc isn’t as easy as shrugging off her innocence. She has responsibilities to her people, to her city, and she’s willing to make incredibly difficult and self-sacrificing choices. But there are constant setbacks to her growing knowledge. She gains understanding in jagged bits and pieces, and she frequently forms a resolution to do the best thing based off incomplete knowledge- which can lead to that resolution being the wrong choice. Her growth, painful and shocking and genuine, was riveting. The relationship that grows between her and Gem, based on deceit and hope and a very fragile future, slowly becomes something real, shocking the hell out of both of them. I love the darkness in this story, something so much more than the literal darkness of Isra’s blindness. The roses are creepy and haunting and lovely, kind of like a botanical version of the Weeping Angels. Needle’s faithfulness and ingenuity, Bo’s desperate need to make his father proud, the dark and disturbing history of the city, and the staggering deprivation of the tribes…there are points where this story becomes genuinely heart-breaking. Seriously, there was one part where I had to close the book and fight the urge to swear at Stacey Jay, because holy hell, my poor heart! But there’s so much beauty to it as well, not the beautiful or a person or a landscape, but the kind of beauty that really does change the world in the right conditions. If you love fairy tale retellings, if you love the places where science and magic clash, if you love journeys of discovery, this book is definitely for you. NNNNNNGGGGGGGGHHHHHHH I want to read this book so badly! Ugh. Ugh ugh ugh. Bump it up in your queue! It’s amazing!